Cannas are a tropical perennial native to areas in Central and South America and the southeastern United States. The plant is hardy in USDA growing zones 8 where the rhizomes can winter outdoors in the planting soil. 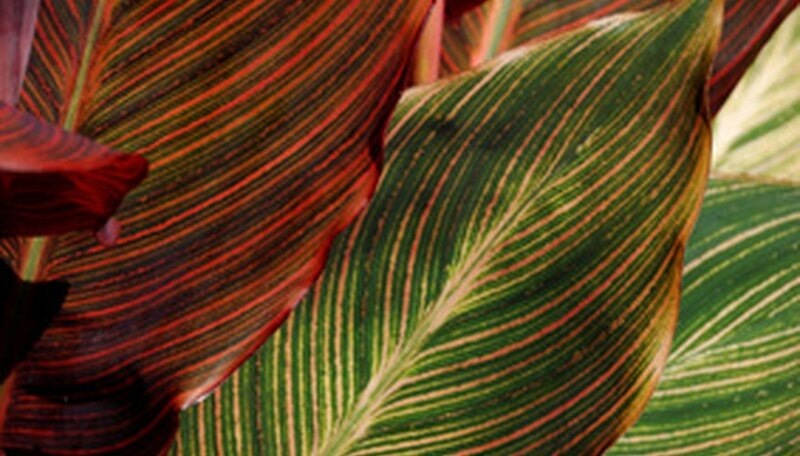 Cannas grow up to a height of 8 feet and produces blooms from mid-summer through early fall in the color of red, pink, orange and yellow. The foliage color varies from light green to purple and is similar to those found on a banana tree. Plant the cannas in a well-draining soil with full sunlight. Dig a hole that is 4- to 6-inches deep and set the rhizomes in so the eyes are facing up and cover the hole with soil. Space the plants two-feet apart for tall-growing varieties and one-foot apart for medium and dwarf varieties. Water the cannas generously after planting to stimulate growth. Continue to water the plants during the growing season to keep the soil moist. Cannas grow best when the soil is kept evenly moist during the growing season. The soil may require additional water during the hot summer months and periods of drought. Fertilize the plants in early spring with a 5 percent nitrogen fertilizer at a rate of 2 pounds for every 100 square feet of planting area. Continue to water the plants each month during the growing season to increase blooming. Deadhead the plants by removing spent blooms to stimulate additional blooms and a longer flowering period. Remove yellow leaves but do not cut back the foliage, as it gathers energy for the next season’s growth. Cut back the foliage to 2- to 3-inches above ground level after the first frost in the fall. The foliage should not be cut until the plant begins to die off naturally. The cannas will go through a winter rest period and begin to grow again in spring. Propagate cannas by dividing rhizomes in early spring. Dig the plant from the ground and divide off sections of rhizomes growing off the main crown. Plant the rhizomes in a hole that is 4- to 6-inches in depth.